There are a number of brand new things for staff members at Online-Druck.biz. Jobs were previously produced using sheet printing systems from Xerox, Kodak and Canon. 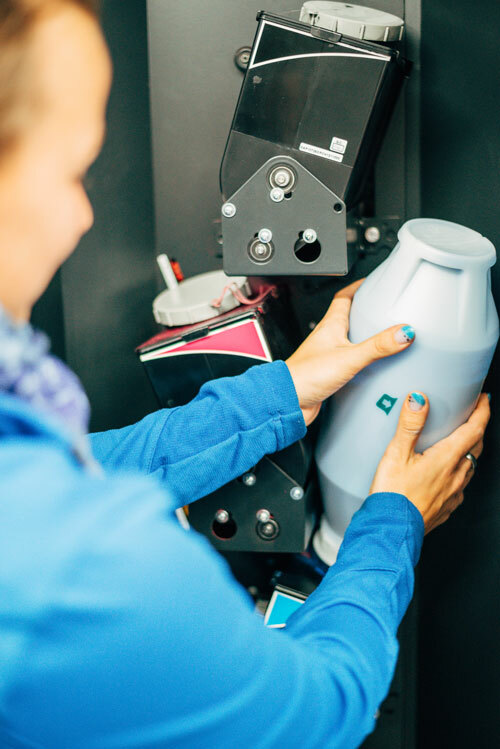 For the first time, the digital printing specialists are handling paper rolls of up to 600 kg in weight. This challenge has been taken on by two female staff members. This manufacturer is much stronger now that Xeikon is part of the Flint-Group. The paper guidance is comparatively simple in roll digital printing. There are no jams as can occur in sheet printing. Xeikon digital printing is designed for productivity in line with industrial quality requirements. 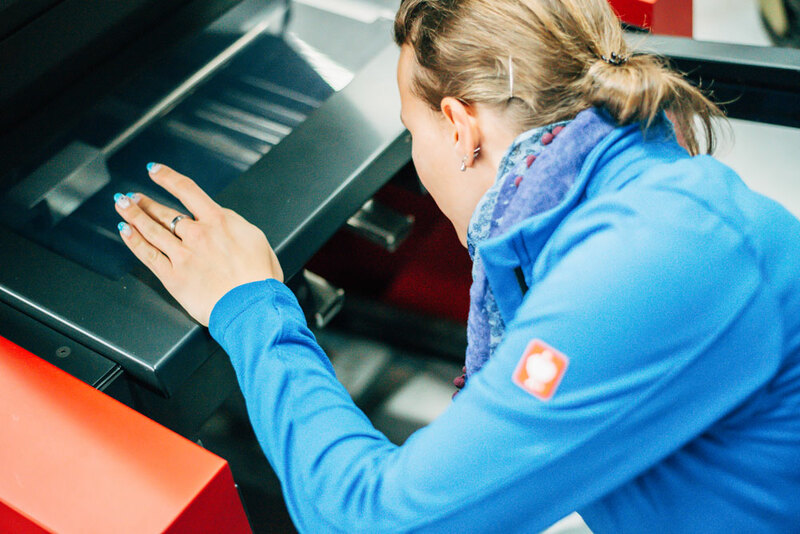 Test prints can be removed from the upper tray at any time. Department head and operator after inserting a new paper roll for a book job. With Xeikon roll, printing the jobs are often finished in half the time. Bianca and Manuela have considerable experience in digital printing. They are familiar with the large high-performance sheet systems and make up the Xeikon team. They are enthusiastically supported by department head, Christian Ott. With Xeikon roll printing, pretty much everything is different than with sheet printing. When a roll is loaded, jobs run for several hours without interruption. Mainly books, brochures and flyers are printed. The strength of Xeikon is its high speed and as a result the efficiency in production print quality. 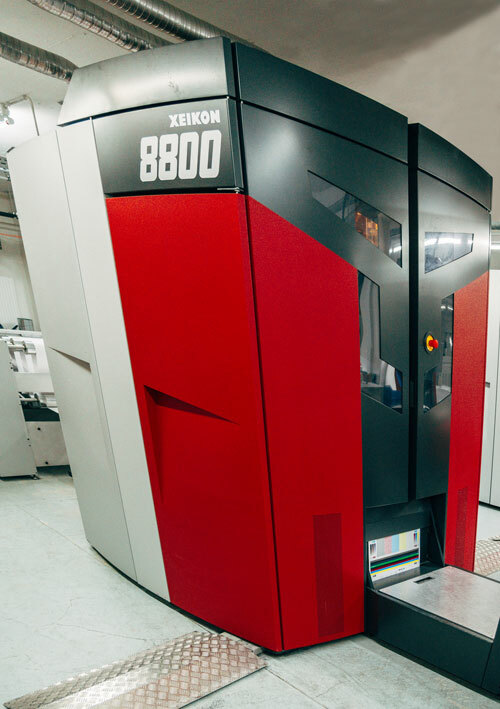 The 10 printing units on each machine make the Xeikon 8800 around twice as fast as a good sheet digital printing press. 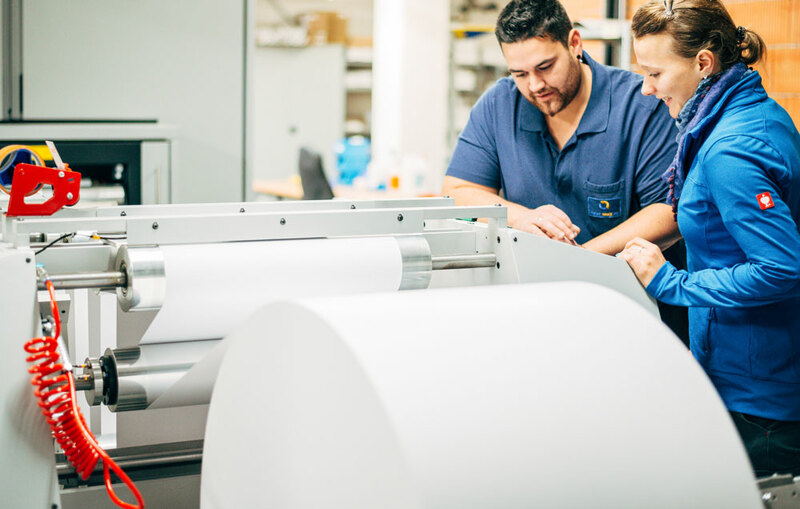 For colour books with a high number of pages, up to 46,000 printed sheets run from a roll. If the first test copy is OK, the roll will need to be changed in 6.5 hours. 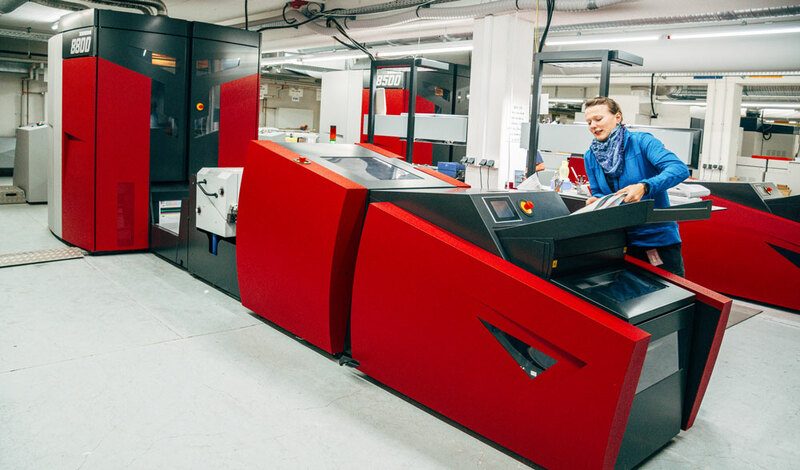 Printing on Xeikon systems is therefore a relatively relaxed process for competent operators. 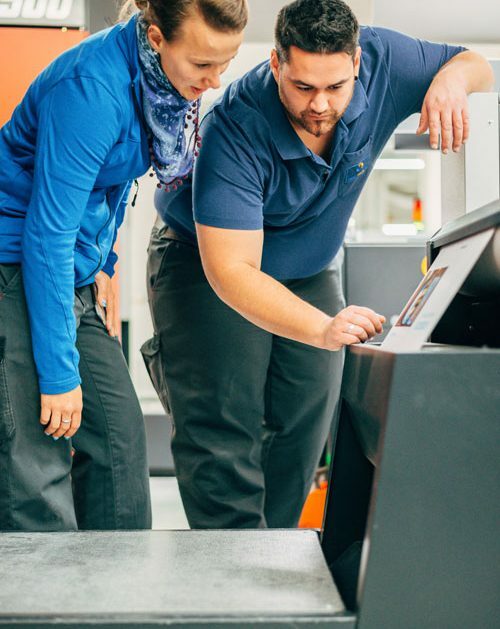 An error-free material feed is ensured thanks to very good roll guidance. The additional printing of spot colours is also possible on both sides. The first look at the printed image: all seems well. This is confirmed by the test print arriving in the top delivery tray: the run can go ahead. 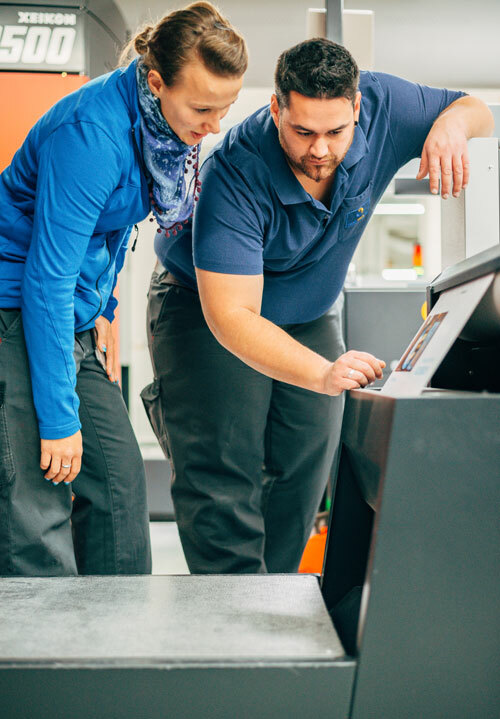 TIP: many customers produce a test print before printing the run. Corrected data can go into the printing process at any time. Deviations in the print run are so low that these can only really be detected when compared directly. 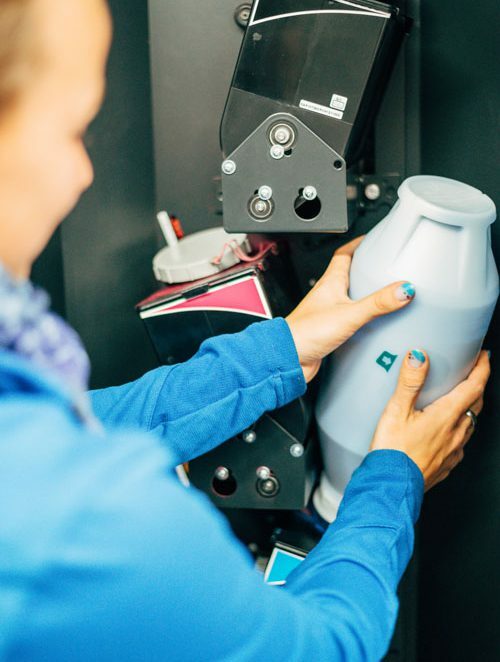 A walk-on printing tower is something entirely new for a digital printer. This simplifies maintenance work. The paper web is printed on both sides simultaneously with 5 printing units per side. Up to that point, the print quality must be checked for consistency during the run and the ink topped up during ongoing operation. 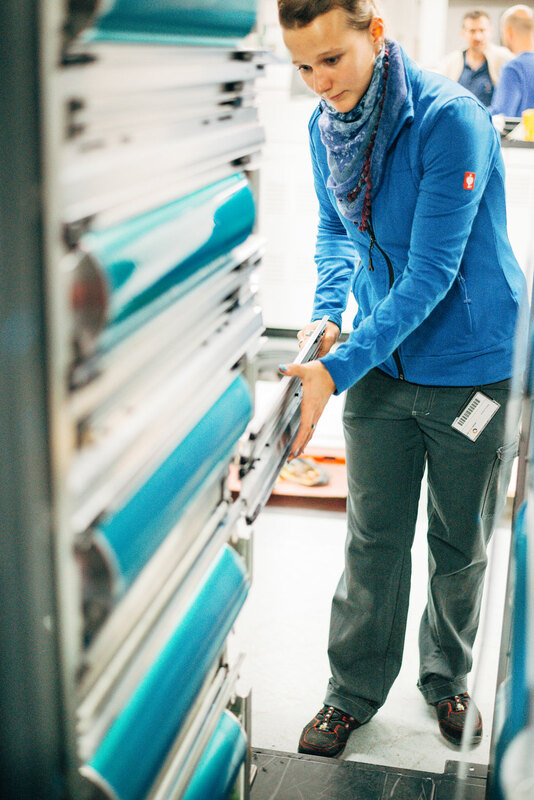 During printing, finished sheets can be removed from the roll-to-sheet module. 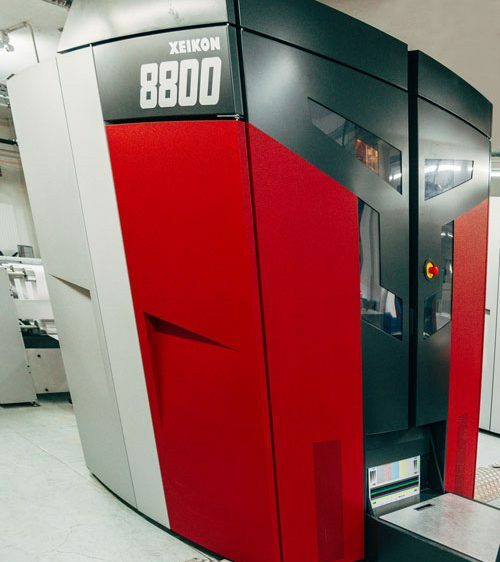 The print processes run stably, so that the operator can responsibly run a second Xeikon. So that colleagues in onward processing can work without errors, the printed sheets are re-moistened. In the printing process, the paper becomes dry due to heat fixing. The re-moistening compensates for the moisture loss of the paper to ensure that high folding quality can be achieved. New toner can be added during the printing process. The colour intensity is ensured in control measurements during the entire run. If you can live with reduced colour intensity, you can save 10% with TOM mode. The black colour is printed at 100% and the colours yellow, magenta and cyan are each printed at 60 percent. The print looks very similar to ink-based printing on natural paper. The picture sharpness however, is considerably higher in TOM printing. The Xeikon 8800 achieves up to 260 A4 pages per minute. A unique feature of the Xeikon digital print systems is the print format. With a roll width of 45 or 50 cm, virtually any lengths can be printed for billboards and posters. Printed products such as A2 calenders or large A2 billboards are typical applications. Even photo wallpapers can be produced. Other staff members are welcome.